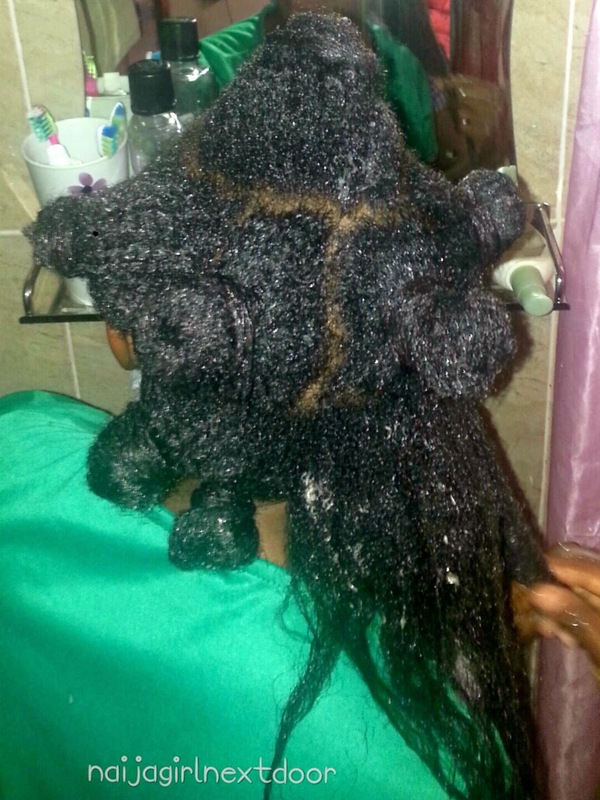 1 rooibos (African red bush) teabag- I've enjoyed drinking this tea since I found it at Shoprite, but this was my first time using it in my hair. I thought it might tone down the hardening and tangling effect of black tea. A large dollop of honey to the brew. Despite the precautions, it was still a fail. Hard, tangled hair. Ouch. 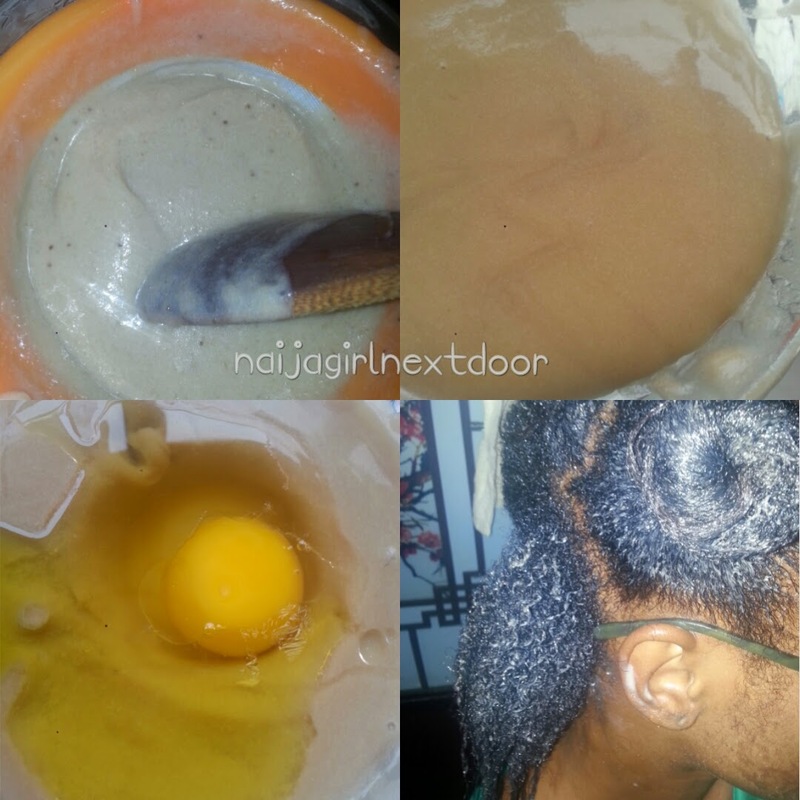 4] I applied Shea Moisture Restorative Conditioner and covered with a plastic cap for an hour. My hair was softened again. I did NOT rinse out. I sealed with my oil mix and got to detangling. 5] Afterwards, I held each section of hair taut and cut off 8cm (3.5 inches) from each. My hair now feels much shorter. My sis noticed too. She walked by a day after and retorted "Your hair is shorter!" I'm just glad I have less of those thin ends to deal with. I still have some way to go before all the relaxed parts are gone though. Ah yes, my happy wash day. 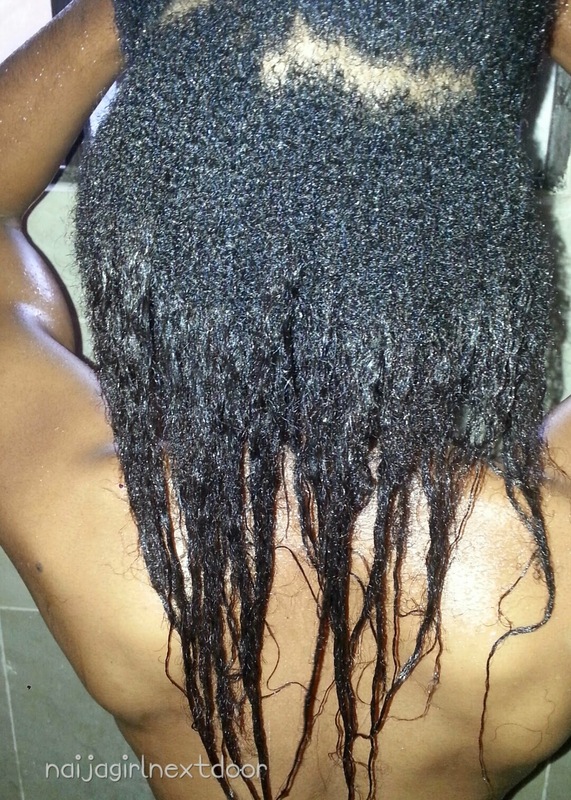 This was in preparation for a protective style. Goals = clean scalp, moisturised and stretched hair. This was my first time ever using bananas in my hair! I've recommended it to others based on the experiences of other bloggers but I somehow never got around to it. I blended the bananas with the shea and a bit of water until smooth, passed it through a sieve (this took so much time! Was it the shea? ), then added the egg and the oils. Didn't measure the oils but about a tablespoon or so each. There was instant softening as soon as I applied it to the sections. I put in 8 bantu knots and covered with a plastic cap and then a towel for 75 minutes. The coverings came off and whoa nelly! Such soft hair! And so much slip it was unbelievable. I was running my fingers from roots to ends no problem! I would pay top dollar for an all-natural product that can do this and I got it in my own kitchen. Shampooed with Shea Moisture Red tea and Babassu Head-to-toe Wash and Shampoo. Leave-ins: Shea Moisture Restorative Conditioner, sealed with Olori Deep Conditioning Treatment. Now I know my poor twistout results had to do with my relaxed hair cos I'm really pleased with how the natural part turned out. One more thing to look forward to for when I'm fully natural eh? So, my questions: Do bananas usually have a hard time going through a sieve? Do you think it was the shea butter? Cos if it was I'll have to leave it out of the blender and probably melt it to mix next time. 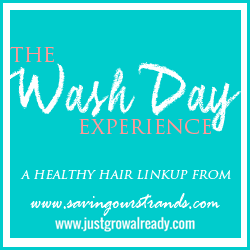 Do join the wash day experience over here to see other wash days and share yours. Wow. I hope the shake worked. I'd heard so many stories about bananas and hair residue that's why I made sure to sieve. Would have been such a mess if not. Your hair looks so thick and healthy! 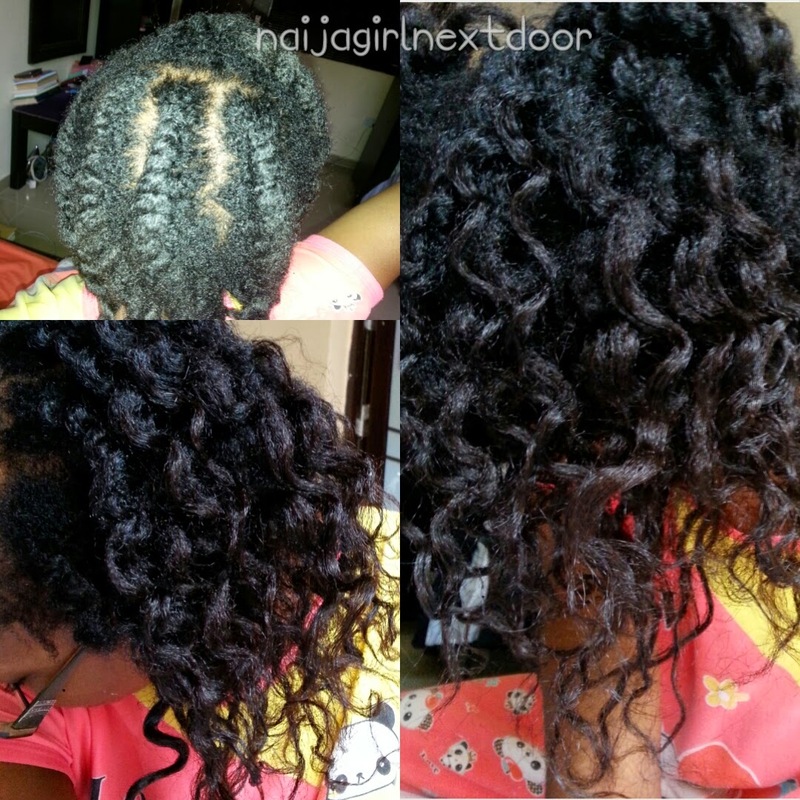 Are you transitioning to natural? Was it the banana that made your hair soft? Hi Rebeca:) Yes I am. 14 months post now. Yes it was the combination of banana and shea butter. You can use banana baby food which is very smooth . Gorgeous twist out. I've never tried any real home made DC's but I here so many great things. Your hair looks very pretty. I'm glad you achieved soft hair with your mix. I suggest you try passing the banana and the shea through the sieve each on its own to see how they fair in terms of time taken to go through the sieve. My first and only banana experience was a disaster, though i did not sieve. But this your story is really encouraging. Maybe, just maybe, i will give it another shot. Yea, twist out is better with all natural hair, i hope to get there someday. Babe, i dey gbadu your hair big time. So, i tried the banana smoothie this past weekend and it was........, you don't want to know. I will just jejely stick with my avacado and egg smoothie which i love so much. Hi Rachel, thanks for the tip. You have so much new growth! 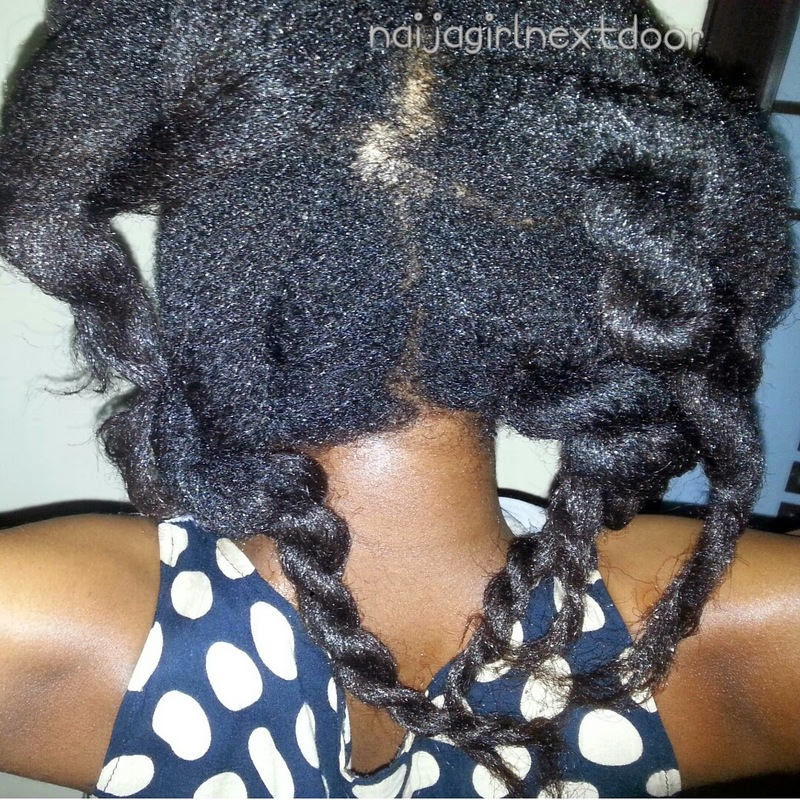 Nice job on your flat twist out. I agree with Rachel's suggestion about washing/rinsing your hair in braids to help with the tangling. love the idea of cooking it first!! Sandra your new growth is popping!!! Keep it up!! Well I don't know much about this but it looks interesting lol, and I really love natural hair when it's gotten right, and you my dear are doing just that. Love how healthy your hair looks! Good thing you sieved your banana mix first - also try sieving it before adding the shea; it wont be as difficult. i transitioned as well, hair loss is inevitable because the relaxed ends fall out.